Let’s start with this: I love Miller Park. I love the tailgates. I love the sausage race and Bernie Brewer and his ridiculous slide (even if the team should bring back the mug). And I love the roof. I grew up in Trempealeau — near La Crosse, a solid five-hour drive from Milwaukee, and longer with gameday traffic. For our family, the prospect of spending 10 hours in a car just to get a rain check was a major turn-off. It’s partially why my first baseball game was at the Metrodome; I never saw County Stadium. The roof guarantees we’ll have baseball, and that was (and is) critical for the Brewers fans like myself who aren’t from Wisconsin’s population centers in Milwaukee and Madison. When the public funding for Miller Park passed in 1995, projected costs were $250 million for the stadium and $72 million for additional infrastructure, minus $90 million to be provided by the Brewers themselves. I bring this up because these figures are similar to the projected public expenditure for a potential new stadium for the NBA’s Milwaukee Bucks: taxpayers are slated to pick up half of the expected $500 million tab on the proposed downtown arena. But “expected” and “projected” are critically important words. Miller Park, in reality, has cost taxpayers far more than the roughly $250 million they were expected to pay, and those costs are continuing to accumulate even today. Throughout the process, the burden has been placed on the backs of Milwaukee taxpayers, even as the Brewers franchise value has climbed to unprecedented heights. 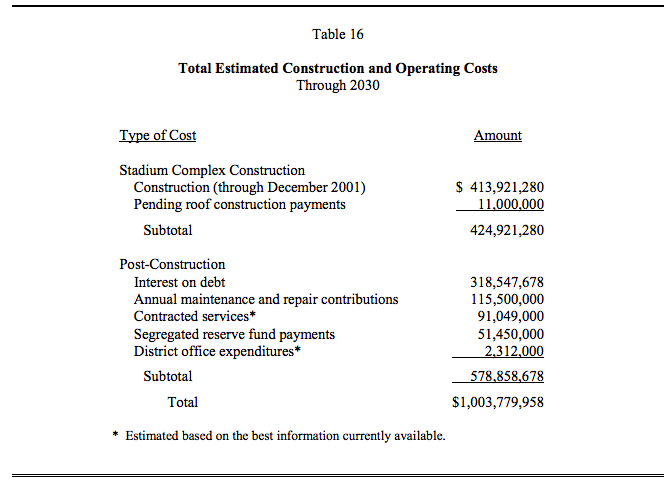 Public investment in building the stadium and operating and maintaining it for a 30-year period is substantial. When the lease expires in 2030, we estimate that all costs, including construction, debt service, administration, and maintenance, will total $1.0 billion. The LAB hasn’t issued a report since, but Milwaukee reporter Bruce Murphy has followed up on this story multiple times, including for Milwaukee Magazine, where he tabulated the costs for the ballpark at $820 million (not including interest, which would take the cost to $1.1 billion). 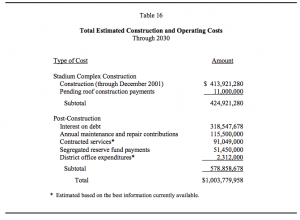 In 2012, for UrbanMilwaukee.com, Murphy calculated the cost of the stadium at $1,585 per household in the five-county area where a 0.1 percent sales tax was levied to pay for the stadium. About that tax: it kicked in on January 1, 1996 and was slated to run through 2010. The LAB’s first report on Miller Park expenditures in 1999 already predicted the tax sunset wouldn’t come until at least 2014; by March 2002, the Southeast Wisconsin Professional Baseball Park District finally came to the same conclusion. By the time of Murphy’s 2012 UrbanMilwaukee report, the tax sunset had been pushed back to “sometime between 2018 and 2020;” a Milwaukee Journal-Sentinel report from this March came to the same conclusion. This tax, like all sales taxes, is regressive. It targets the poorest members of the community disproportionately. They are the ones spending the largest percentage of their income on groceries, clothes, and other basics in local stores. The 2002 LAB report stated the park district was collecting $1.7 million per month off the sales tax. By the time of the Journal-Sentinel’s 2014 report, that number was up to $2.4 million. The tax has already been extended by over four years and $100 million more than initially expected. Should the tax last through 2020, we can add another $142 million to that total. So, at least these taxpayers own the stadium, but it’s hard to tell exactly what that entails. It’s not like they get to hang out there. It’s not like they get free tickets. Basically, they own a gigantic mountain of debt. And by the time its paid off, Miller Park will either be obsolete and we’ll need to start raising cash for a new park before another round of contraction rumors begins. Or maybe the clause which obligates the park district to “keep the stadium’s complex’s quality the same as that of at least 75 percent of all Major League Baseball stadiums” (p. 30 of the LAB report) will kick in and push the tax sunset back another decade. Bud Selig made $223 million when he sold the Brewers to Mark Attanasio in 2005. He didn’t even buy the Brewers. He spearheaded a group that acquired the Seattle Pilots out of bankruptcy court. There isn’t even a return on investment analysis to be done here. There was no investment. The value of Selig’s franchise rested entirely on the fact that they had homes to play — first County Stadium, the nation’s first publicly funded stadium, and then Miller Park. Meanwhile, the Brewers franchise value has skyrocketed to $875 million by Forbes’s calculations — and again, that value isn’t there without Miller Park and the millions of taxpayer dollars Milwaukee’s citizens, including its poorest, including those who can’t afford Miller Park ticket prices, footing the bill. And they won’t see a cent of it when Attanasio eventually sells the team, nor ever. We build it. They make the money. And we don’t even get a say. 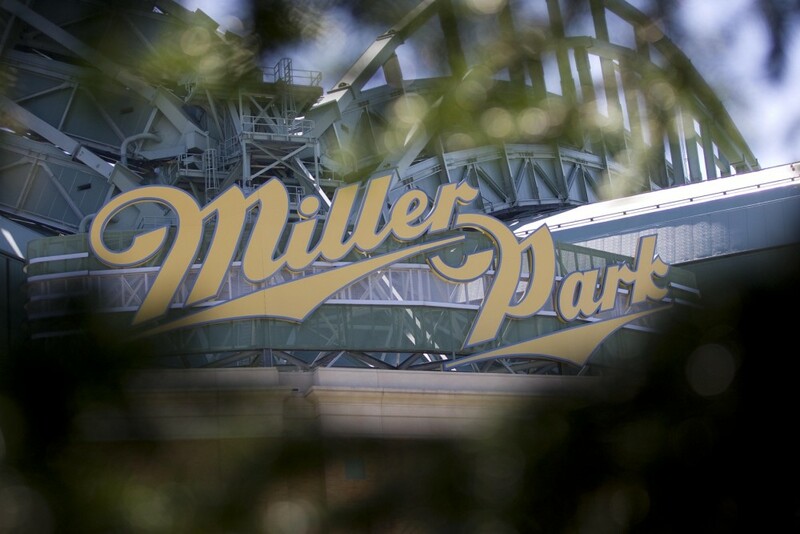 Miller Park funding passed in the state legislature without a vote from the public. It’s unclear if Wisconsin voters will get a voice at all in the new Bucks stadium, but as things stand, it’s up to the state legislature, again. I don’t know what to do. There isn’t anything to do about Miller Park, and other than supporting organizations like Common Ground, which is the loudest grassroots organization on the issue in the area, I’m not sure what we can do about the Bucks stadium either. But I do know we need to talk about this, because sports media and sports fans are all too happy to be distracted by shiny new buildings and fancy retractable roofs rather than depressing talk about finances and taxes. We need to talk about this, because as things stand, sports owners don’t just own their teams, they own their cities and their states and the citizens who reside within. All we get is the debt. And that is as un-American as it gets. I find this article perfectly cromulent for our first post here at BP Milwaukee. Public debt is, always has been, and always will be the most effective vehicle for redistributing wealth upward, from those who shoulder the debt–taxpayers–to those who “own” the debt–bondholders. What to do? Short of required courses in political economy, which approximately .000001 percent of U.S. educators are qualified (or care) to teach, it’s difficult to say. Bring back the mug! Excellent article. Super excited that BP has turned its focus on the Brewers! You are filling a much needed hole in Brewers coverage.